Last week, Vietnam’s deputy defense minister paid a four-day official visit to India. Although the visit was just one of a series of scheduled defense engagements by the two sides for 2018, it once again put the spotlight on growing security ties between the two Asian states amid wider domestic and regional developments underway. As I have noted before in these pages, Vietnam and India have been looking to advance their existing defense relationship as part of their wider ties, which were elevated to a comprehensive strategic partnership in 2016. Defense ties have grown in recent years to include not just the traditional components of ties like exchanges and port calls but also the training of personnel, capacity-building funding and equipment, coast guard collaboration, and pacts on areas such as white shipping and outer space. That trend in defense ties has continued on into 2018. The defense component of the relationship has featured in high-level exchanges between the two sides, including visits to India by both Vietnam Prime Minister Nguyen Xuan Phuc and President Tran Dai Quang in January and March 2018 respectively. In June, India’s Defense Minister Nirmala Sitharaman also visited Vietnam which saw the defense aspect of ties highlighted again. 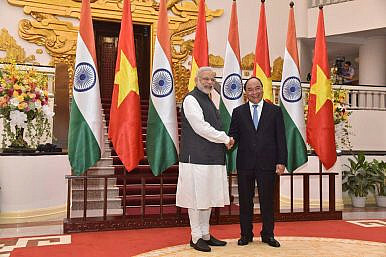 This week, the relationship was in the spotlight again when Vietnam’s deputy defense minister, Nguyen Chi Vinh, was on a visit to India. Though the visit, which lasted from July 31 to August 2, saw Vinh participate in a series of engagements, the highlight was when both sides chaired the 11th iteration of the Vietnam-India Defense Policy Dialogue at the Indian defense ministry. According to official accounts of the meeting, both sides used the opportunity to review the state of defense ties to date, including progress on the implementation of already agreed areas of collaboration. They also discussed ways to improve ties further in various aspects, including with respect to bilateral ties in terms of areas such as maritime security, defense industry collaboration, science and technology, and training. Apart from the areas of collaboration, some of the headlines, particularly in India, were unsurprisingly focused on the state of potential deals on defense items between the two sides, as well as the wider geopolitical implications of closer India-Vietnam ties for New Delhi’s broader relationships, including its ties with China. As I have observed previously with respect to such interactions, inroads both sides are continuing to make should not obscure the broader realities and structural constraints that exist, including India being just one partner for Vietnam within its wider omni-directional foreign policy, the limits of strategic alignment between New Delhi and Hanoi across specific issues, and the remaining obstacles to development in particular areas of defense cooperation on both sides despite the sunny rhetoric. Nonetheless, engagements at various levels, including this dialogue at the deputy ministerial level, continue to provide opportunities for both sides to manage this aspect of ties.